Thanks to the integration between outdoors and indoors, this versatile and open-concept space can be fully enjoyed both in summer and in the cooler seasons. The large windows look out to the relaxing waterfall, the River, which provides a stunning backdrop for the lounge. The large bar counter boasts modern and minimalist lines, while a built-in glass display, showcasing the finest labels of gin, vodka, whiskey and rum, serves as a background on the soft-hued wall. 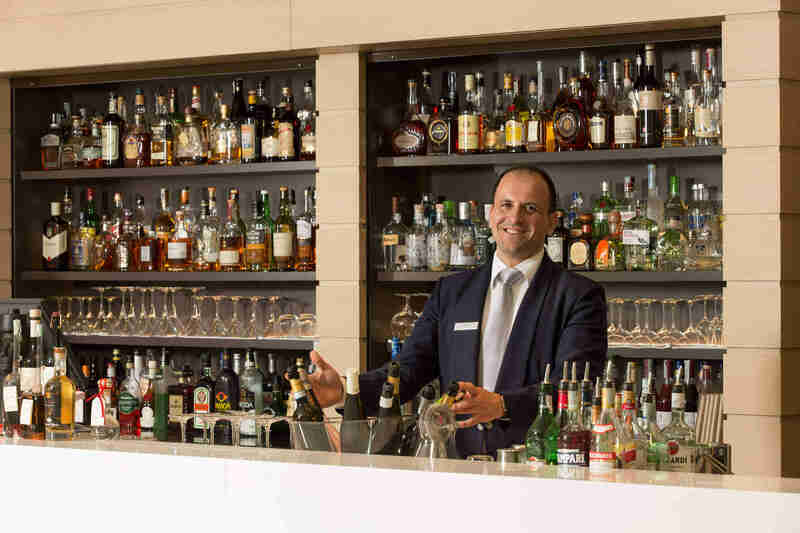 During the day the bar serves coffee and snacks for an informal lunch or a quick bite, while in the evening it is animated by live piano music and the eclectic cocktails prepared by our bartender. A welcoming and fashionable location for an aperitif Italian-style or with an international flair, or for a glamorous after dinner, or better still, to smoke a cigar accompanied by a grand cru or a distillate. The River Lounge Bar is in fact designed to be enjoyed at any time of the day, with a menu selection that ranges from light fares and fresh fish dishes to an exclusive selection of gin & tea. The meeting point between the world of Almar and Almablu, the bar is the ideal place for a relaxing pit stop in the life of the resort or a refreshing break during a day at the spa. In fact, the menu offers food choices specifically designed to nourish the body with their precious vitamins and to maintain the psychophysical balance and energy obtained through the Almablu treatments. The name “The River Lounge Bar” was inspired by the waterfall it overlooks, the River, which becomes part of the interior space thanks to the expansive skylight. The contact with water is thus maintained both visually and through the soft sound of a small refreshing waterfall. 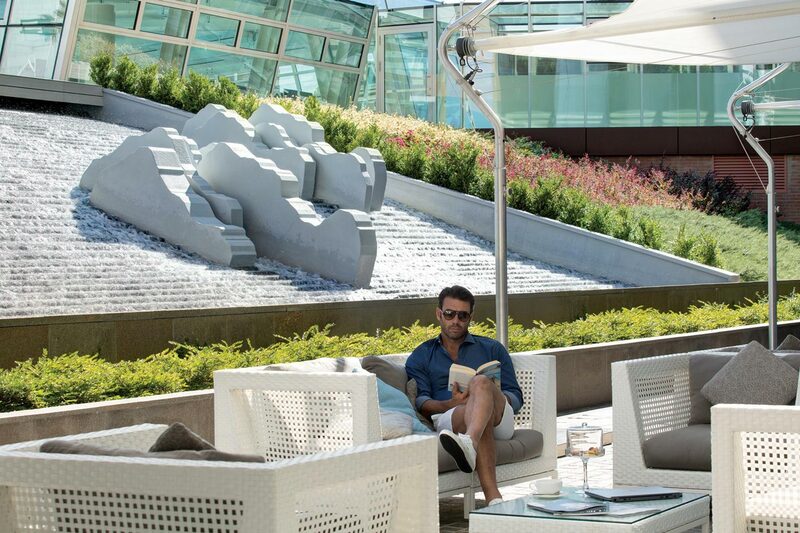 The synergy with the water element is also enhanced by the fluid nature of The River Lounge Bar, a flexible solution both in winter and in summer, day and evening. From the moment the first lights lit up at dusk until after dinner, The River Lounge Bar becomes a space dedicated to the world of Gin, where dim lighting and the sound of ice cubes clinking in the shaker create a soft and chic ambience reminiscent of American Bars. In addition to the excellent gin cocktails, from classics such as White Lady to the special Almar Cocktail, made with Gin, Cointreau, the juices of pineapple, grapefruit, orange and strawberry syrup, the bar serves Gin Martinis with surprising combinations and unmissable Tailored Gin & Tonic. Not to be missed: Monkey 47 Tonic, made with Gin Monkey 47, cranberries, lemon, orange and fever tree tonic water.